When the eighth season finale of The Big Bang Theory came to an end there were two revelations that signaled some serious promise for the show. There was Leonard admitting that while on his arctic research expedition, he made out with another woman. The show quickly resolved that bit of conflict though; perhaps too quickly, considering how many conflicted emotions could be wrought from such a scenario. The other revelation was that Sheldon had an engagement ring meant for Amy. Now, the show never made clear when Sheldon was going to propose, but there were certainly signs that it would have been soon had Amy not (rightfully, to be honest) broken up with him. “The Spock Resonance” has the makings of a fluff episode, with Sheldon being contacted by Wil Wheaton to be interviewed for a documentary (or Spockumentary) about Spock directed by Leonard Nimoy’s son. Based on historical evidence from throughout the show’s eight-season run, that kind of setup all but guarantees a lot of stale “nerd” jokes. Initially, it looks like “The Spock Resonance” is going to follow through with that, even offering up a typical inconsequential B-plot with Howard and Bernadette arguing about how to redecorate their house. Thankfully, that engagement ring is still sitting in a wall safe (when did they get a wall safe!?) like a neglected gun from Chekhov’s extensive collection. 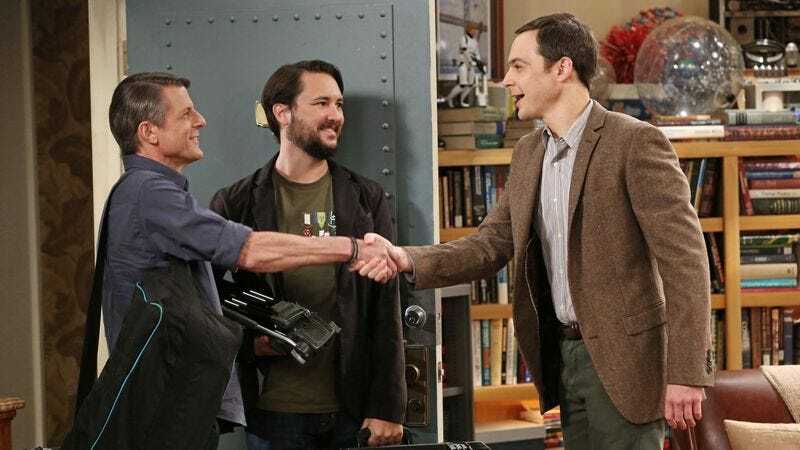 When Adam Nimoy asks Sheldon if he has any Spock memorabilia, Sheldon perks up and is eager to show him his autographed napkin, a gift courtesy of Penny. He goes into the wall safe and removes a lockbox and goes into detail about how important the napkin is to him, and how it contains true Spock DNA—unlike Adam, who is only half Spock DNA because of his mother. When Penny asks him what else is in there, he pulls out his passport, a tiny Wil Wheaton figurine, and the engagement ring he meant to be Amy’s. Penny and Leonard are taken aback, having no idea that he was ready to propose or that he was even considering it. Sheldon shrugs it off as if he’s passed it but then spends the rest of the episode dwelling on Amy. Sheldon’s reaction isn’t exactly unpredictable, but it is nice to see the show finally start to dig into his real feelings about Amy. Watching him deal with the breakup by being childish was funny enough for the first few episodes of the season, but at some point The Big Bang Theory had to do right by the character and get at the pain underneath. 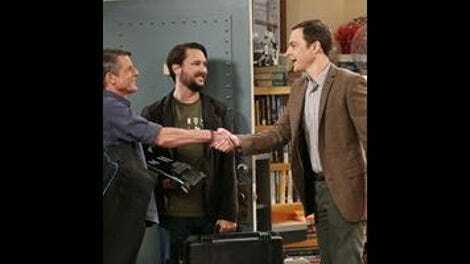 Does that mean the show will go dark with Sheldon? Probably not, but “The Spock Resonance” really…well, resonates. The sudden outpouring of grief and anger from Sheldon is not just a reaction to his separation from Amy, but also a reaction to years of thinking he was removed from human emotion. He always sought to model himself after Spock, to think only in terms of logic and never fall prey to human vulnerabilities. As Penny reminds him though, removing all human emotion isn’t the lesson put forward by Spock because he was still half human and would have experienced pain and love like anyone else. Using Spock and pop culture to frame Sheldon’s anguish is a smart move. He’s always been the guy who views any problems in his life through the lens of comics and TV shows. He’s always privileged the idea that pop culture could explain human interaction and therefore shield him from the more heartbreaking parts of the human condition. Sheldon is a creature of habit, a man who thrives on routine and logic; and as all of us know, what’s more illogical and inexplicable than heartbreak? When going through a breakup all you do is try to make sense of it. You analyze everything you might have done wrong, scrutinize every comment you ever made, or scold yourself for the compliments and subtle niceties you never uttered. But there’s no making sense of it. Heartbreak is a mess, and it can’t be rationalized, at least not to the extent that it eases the pain. For Sheldon, that’s completely destabilizing. Logic and emotional distance has helped him cope with bullies and confrontation his whole life, but there’s no defense against heartbreak. That point is underscored by the tag at the end of the episode, which is often meaningless but here contains a hint of sadness. Sheldon decides to go to Amy’s place and propose to her, to put the whole thing behind him once and for all, no matter what her response is. When he gets there though he sees her kiss another man, the two looking as if they’ve just returned from a date. It’s devastating, so Sheldon does what he knows best. He heads back to his apartment and flips on his beloved Star Trek, the only comfort he knows. As Spock tells Kirk that he only knows logic, Sheldon shouts at the TV, calling out the nonsense of such a claim. For a man who’s spent his life viewing human emotion through the lens of pop culture—in other words, at a distance—it’s impactful to see him rebel against it, especially when that piece of pop culture is Star Trek. Heartbreak can often lead to personal growth; perhaps this is Sheldon’s first step towards becoming more empathetic, and a little less alien. Welcome back to another season of The Big Bang Theory reviews. Now that the show is back on Thursday I’ll be back on the weekly beat. Mondays are strictly reserved for lackluster comic book shows and wrestling. Honestly, the less said about the B-plot tonight the better. It was fine, but really fell back on a lot of the same beats that define most storylines with Bernadette and Howard. I knew it was coming, but my heart still sank when Sheldon saw Amy kissing that guy. I’m glad the show played it that way though. They could have easily gone for awkward laughs.